The latest IPCC special report has made it more clear than ever that the world must change course. The fossil fuel era is over, and we must make urgent strides to clean energy. 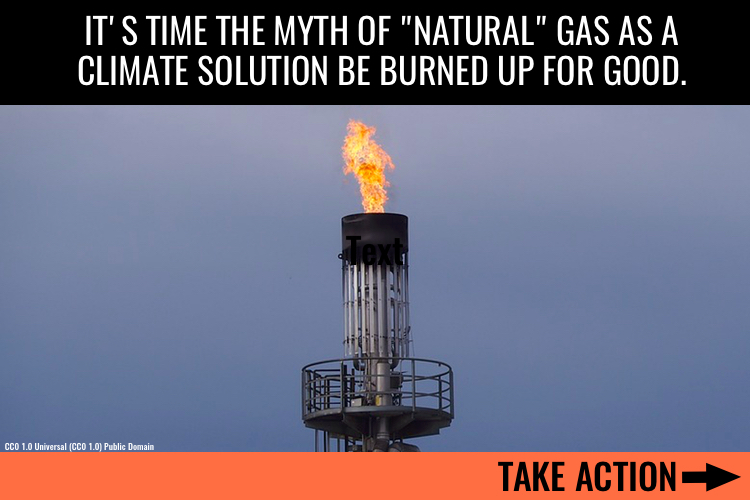 That’s why it’s crucial that we end the myth of gas as a “bridge fuel” to a safe future. Gas must be phased out completely by mid-century at latest to meeting our climate targets, and we can’t afford to lock in decades more of increased production. Gas is displacing new solar and wind – not coal, and renewables don’t need gas as a backup. I stand with communities around the world impacted by climate impacts and gas extraction, and implore you to stop touting gas as a “clean” fuel and to start promoting real clean energy solutions. By taking this action, I consent to join this email list and attest that I am 18 years of age or older. The personal data that I provide will only be used for communicating by email. I understand that I can unsubscribe at any time, and can request destruction of any personal data provided. In October, the Intergovernmental Panel on Climate Change released a report outlining catastrophic scenarios that could unfold if we don’t change course. This report underlined what we already knew: We need to move away from ALL fossil fuels immediately – and that includes fossil gas. Despite this, the G20 – a key international grouping of the world’s biggest economies – is heading toward their annual meeting next month, and plans to affirm the role of gas as a key “bridge fuel” to the future. We’ve produced a new video detailing exactly why the myth that gas is a “bridge fuel” is a deadly and dangerous fabrication that must be busted. Pretending that gas has a place in a clean energy future is madness. But the G20 meeting’s outcomes are still in draft form, and we’ve still got a chance to change them. G20 leaders like Argentina, Canada, the European Union, France, Germany, Italy, and the United Kingdom know climate action is imperative – and they’ll listen if we raise our voices together. Earlier this year, we made enough noise that other world governments successfully isolated the Trump Administration’s horrific positions on coal and the Paris Agreement. Send world leaders a message today that we’ll have their back again – but only if they stop touting gas as a “bridge fuel” and start pushing for real solutions to climate catastrophe.